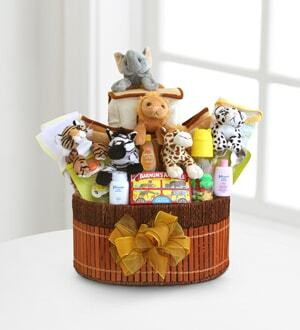 Our adorable "Noah's Ark" is filled with 6 cuddly animals ready to greet the new little one. Also included are loads of baby essentials: a baby bib, baby t-shirt, baby hat, baby bottle, set of pacifiers, a fork and spoon set, Johnson's shampoo and baby powder, and circus animal cookies. This one-of-a-kind gift is a great way to send wishes of happiness for the little one! 07/18/2018 12:08PM PERFECT gift for my sister and my new nephew!! !— Mariame A.